If you are planning to go sun bathing in Egypt, you had better plan your trip sometime soon. The Muslim Brotherhood, or at least, its affiliated political parties wants to place tougher restrictions on tourists in Egypt can wear and do. Egypt’s tourism industry has suffered a severe blow since the outburst of anti-regime demonstrations in January. But that did not stop the Freedom and Justice Party, the political wing of the Muslim Brotherhood, from demanding stricter regulations over what tourists can do and wear while visiting the country. The party is urging officials to ban skimpy swimwear and the consumption of alcohol on Egyptian streets. The call for new strictures on tourists comes as Egypt debates the role of Islam in the post-Mubarak era. Freedom and Justice is competing in elections scheduled for this autumn for parliament and opinion polls show a majority of Egyptians favor a greater use of Islamic law and mores. But a vocal minority worries that Egypt risks becoming an Islamic republic. I am sure there is a larger number of Egyptians who are looking forward to Egypt becoming an Islamic republic. Of course this sort of thing will hurt their tourism industry. I don’t see large numbers of tourists going to Iran these days. But, I suppose economic considerations are secondary to doing the will of Allah. Personally I don’t have a problem with banning bikinis or alcohol. I do worry about this though. But bathing suits are not the only worry of Egypt’s Islamists. Abd Al-Munim A-Shahhat, a spokesman for the Salafi group Dawa, has said that Egypt’s world-renowned pharaonic archeology – its pyramids, Sphinx and other monuments covered with un-Islamic imagery – should also be hidden from the public eye. 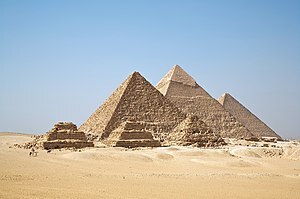 “The pharaonic culture is a rotten culture,” A-Shahhat told the London-based Arab daily A-Sharq Al-Awsat on Wednesday, saying the faces of ancient statues “should be covered with wax, since they are religiously forbidden.” He likened the Egyptian relics to the idols which circled the walls of Mecca in pre-Islamic times. I doubt that would be a popular position to take in Egypt, since I suspect that the vast majority of Egyptians are proud of their country’s ancient history. Still, there is a link between radical Islam and iconoclasm. Remember the destruction of the Buddhas of Bamiyan by the Taliban. Egypt has generally been more liberal, but the Sphinx’s nose was chiseled off in 1378 by a Sufi named Muhammed Sa’im al-Dahr when he discovered Egyptian peasants worshipping it. He was hanged for vandalism afterwards, so maybe the Egyptians are still more sensible than some in the region. This entry was posted on August 29, 2011 at 1:46 pm and is filed under History, Religion of Peace, What's Happening. You can follow any responses to this entry through the RSS 2.0 feed. You can leave a response, or trackback from your own site. And they wonder why they can’t move forward. Freedom brings prosperity, control brings ruin. They’ll never move forward and become powerful with this mentality.